I have been to Boston quite a few times, but definitely not enough to know the city as well as a local, with my most recent visit being with the French exchange students. However, I have visited enough to know the best and the worst of this great city and all that it has to offer. Yes, the stereotypical duck tours. Chances are if you’ve been to Boston you’ve seen at least about a dozen of these part boat/part cars roaming the streets, carting around tourists. They can be fun the first time, especially if you’ve never been to Boston before. 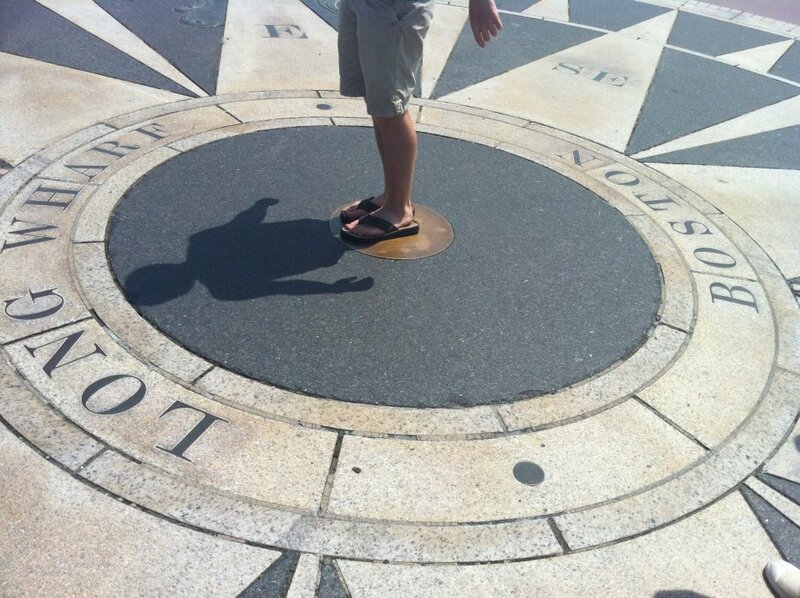 But if you’re like me, and don’t like these guided and overpriced city tours…. Tour the city on your own instead! 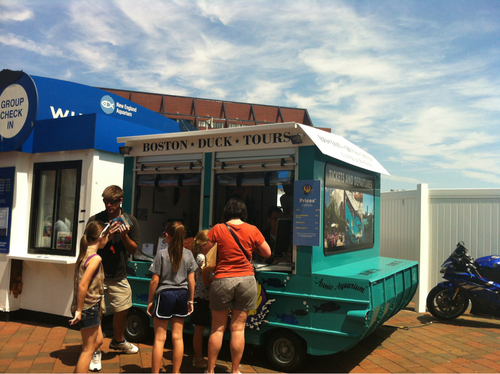 I think I went on a duck tour once when I was very young, but nowadays I mainly just walk around. And when you walk around on your own and just roam, you may not hit all of the big “highlights” nor hear long spiels from guides about how historic a random, old building is nor hear them say “Did you know Leonardo DiCaprio ran down the staircase of this building on the set of (insert movie title)?” (We actually did hear this from a passing segway tour guide, and speaking of segways I’ve always wanted to ride one of them around a city. It looks like so much fun). Despite not having those things a guided tour may have, exploring on your own gives you a whole lot more. You can stop wherever you feel like, eat whenever and wherever you want, and you basically just have more freedom which is exactly what I need. And even if you don’t see the biggest tourist attractions of the city, you find something even better – more hidden and unknown yet beautiful parts of the city you never would have discovered on a tour bus or duck tour. We discovered this little walkway/park pictured above, which had these paths shaded by these trees growing around it, benches scattered around, and fountains, which made it into this perfect, beautiful, quiet getaway from the rest of the city. Finding cool little places like this is what I love most about exploring a city. When I was 11 years old, my class went on a field trip one day to Boston and we walked the freedom trail with a guide explaining this and that along the way. And it’s honestly the perfect way to get to know Boston if you’ve never been here before. 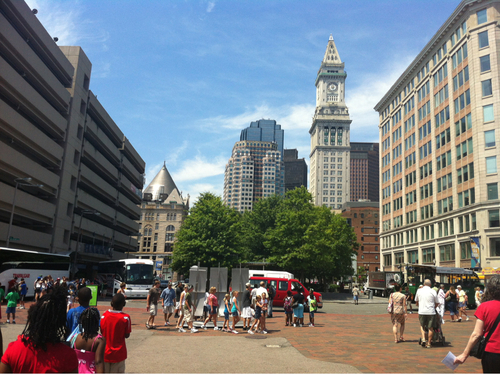 Without a guide of course, once again bringing up the freedom concept mentioned before (It is the Freedom Trail!). But you don’t need a guide to do it. It’s not some imaginary path through the city that only a select few, gifted people have memorized. It’s an actual, visible, brick path with its own Freedom Trail markings that goes all throughout the city. It’s impossible to get lost since it is marked, and even if you are some history fanatic, it takes you through past all sorts of historical landmarks too. And you won’t need a guide to explain each landmark because chances are if you are a history fanatic you probably already know all about them anyways! 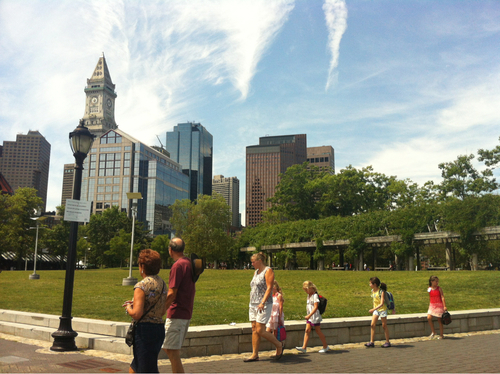 One of these days I just want to go back to Boston and spend the day walking it. It would be a non-expensive, enjoyable day. Not a hall or just one building, as the name could make a clueless foreigner think, but a large walking-only area of stores and food. Whenever I come to Boston, I always end up here one way or another. Unless of course it’s one of the many times I’m visiting my mother’s office on the 48th floor of the Prudential Building, in which case I stick to that building. But why do I always end up here? If you think it’s for the shopping, as this place is so well known for, think again. I’ve never bought anything from the stores in this little area, save for this one Truth or Dare book I bought at Urban Outfitters for a party. Everything in Boston is ridiculously expensive compared to everywhere around it. All the clothes are way cheaper at the malls in my home state of New Hampshire, especially since there’s no tax there like there is in Massachusetts, so I tend to stay away from buying anything in this city. 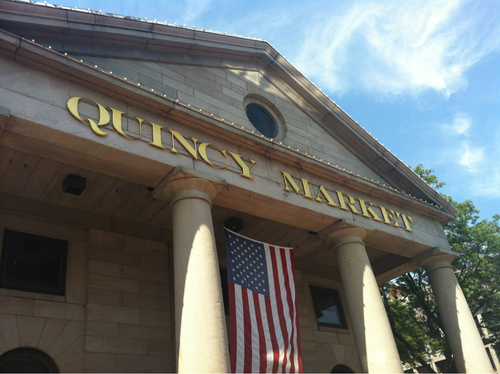 Even all the food you can buy from the places at Quincy Market, which is in the center of Faneuil, is overpriced. Like $7 for an ice cream cone?? You’ve got to be kidding me. You could get ice cream twice that size for $3 at the place where I work. And then again I get ice cream for free because I work there. So why do I always end up at Faneuil Hall? Because it’s got some serious character. I’m not talking about the hordes of tourists, primarily Asians hiding beneath umbrellas. I’m talking about the workers running through, carting boxes of this and that to their business. I’m talking about the unique way many of the buildings are built, some looking very historical and Revolution-era. I’m talking about the random weird things, like the giant macaroni outside the three-story Abercrombie store tempting all who pass by with the words “You know you love it” written, like the little vendor selling funny-looking lobster hats with a smile on her face, and like the underground candy store you never thought could’ve existed until you actually find it. And my favorite of all, I’m talking about all the street performers who have turned Faneuil Hall into their stage. I’ve never been here without walking by someone singing in the streets or playing away with joy on their keyboard, hoping for some donations. Whether it be a man in a kilt riding a nine-foot unicycle while juggling knives, or a one-man band wandering around with a multi-instrument machine strapped to his back, you’re sure to find something when you come to this place, which is what I love most about it. 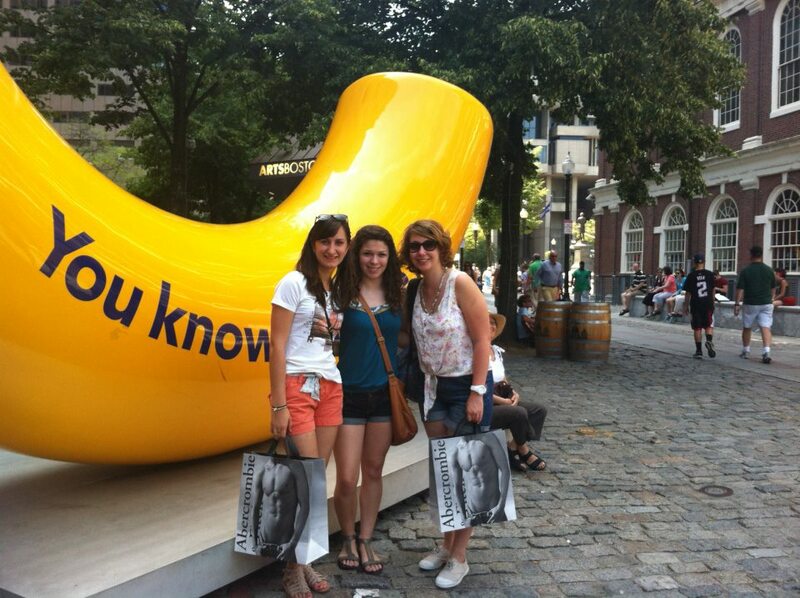 I’m in the center, and without an Abercrombie shopping bag of course! I don’t care if you’re a 3rd grader on a field trip, a college student, or a middle-aged adult with three kids. This place is awesome and so much fun. I’m not much of a museum person, and I absolutely hate going to art museums most of all. The only museums I’ve really loved are the Smithsonian Natural History Museum in Washington DC, and this one. Except Boston’s Museum of Science is way better. It triumphs over all museums in my mind, or over all the ones I’ve actually been to for that matter. I could write a whole, long post just about my favorite things at this place. So just take my word for it, and go here. You will definitely not regret it, and get an awesome day in return. 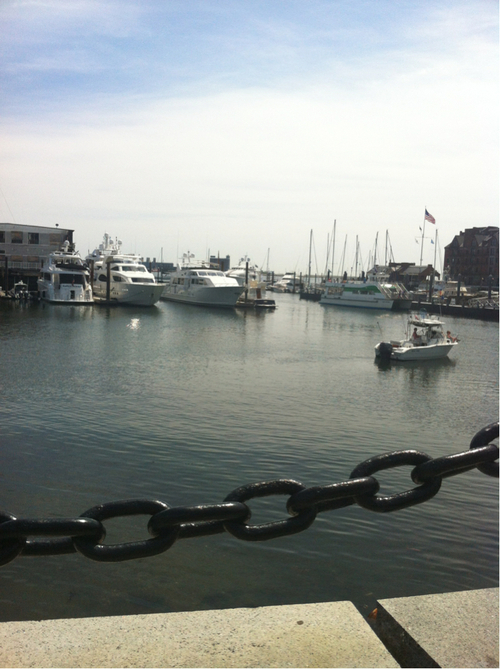 Private boats and cruises and whale watches mozy in and out of Boston’s Harbor, but I just like to come here to sit and relax in the summertime. It offers a cool respite from the beating sun in the rest of the city with its ocean breezes, unless of course you’re here in winter in which case you’ll just freeze. It’s just generally a nice place. Whenever I come here it’s always weird to think that literally tons of tea were dumped into the the Harbor during the Boston Tea Party. Speaking of which, I don’t think it would be in anyone’s best interest to jump into that water. There’s 300 year old (well 239 to be more exact…) tea and god knows whatever other nasty things in that water…..so yeah not the best idea. Whale watch boats typically leave the harbor every day in the summer, but they’re not always the best. It’s like a game of chance basically – there’s no way for you to know whether or not you’re actually going to witness any whales or other marine mammals. The people who work on these boats do try their best, but sometimes it just doesn’t work out. When I was much younger, my family and I went on a whale watch, were unlucky, and didn’t see anything. However, a year later, I went out into the ocean with my friend on her family’s boat and a humpback whale came out of the water within a hundred feet of the boat. It was insane. Such a cool sight. So if you do get lucky on the whale watches, it’s totally worth it. Riding on boats is always super fun too though (at least I think so) so even if you don’t see any whales you still get the boat ride. If you don’t see any animals on the whale watch, you could always come to the Aquarium instead. It’s right along the harbor and there’s everything from adorable penguins to some scary-looking sharks. 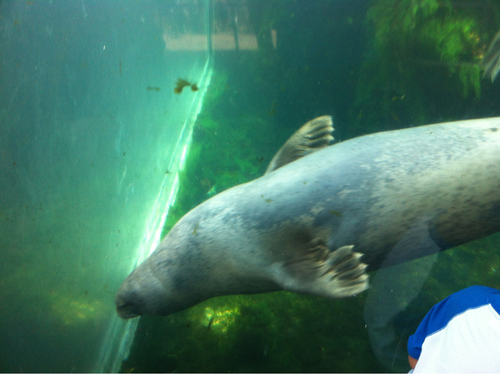 And if you don’t want to shell out the money, there’s one free exhibit right outside with some playful seals spinning around in the water, entertaining their audience. 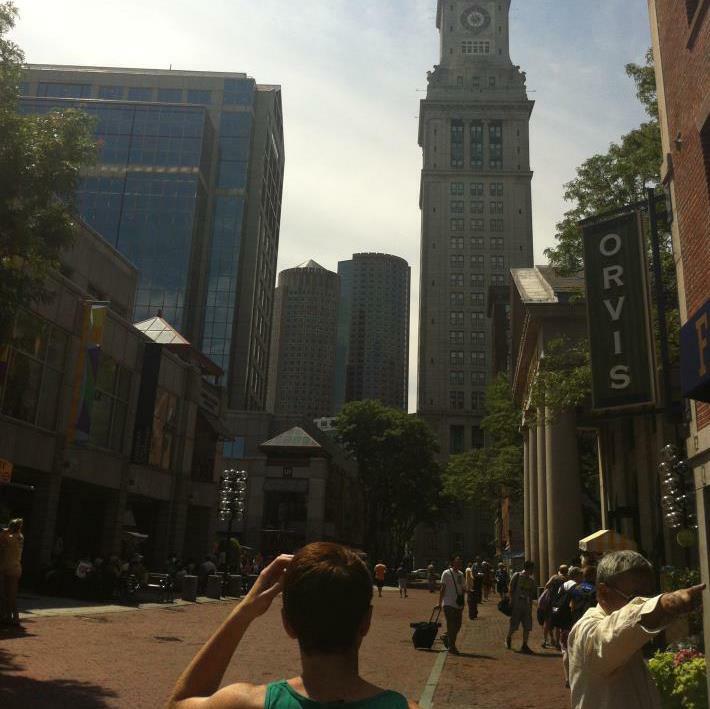 So there you have it – my views on all sorts of places and activities around Boston, the nearest big city to my hometown and one I love to go to. Of course, those aren’t the only places in this city though. 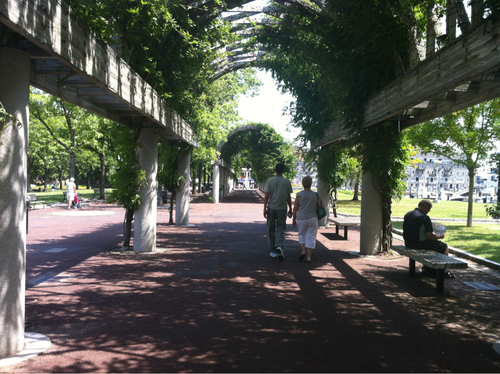 Harvard Square is a really nice place too, and the same goes for the Boston Commons. Newbury Street is another area famous for its shopping, although it is also really expensive. 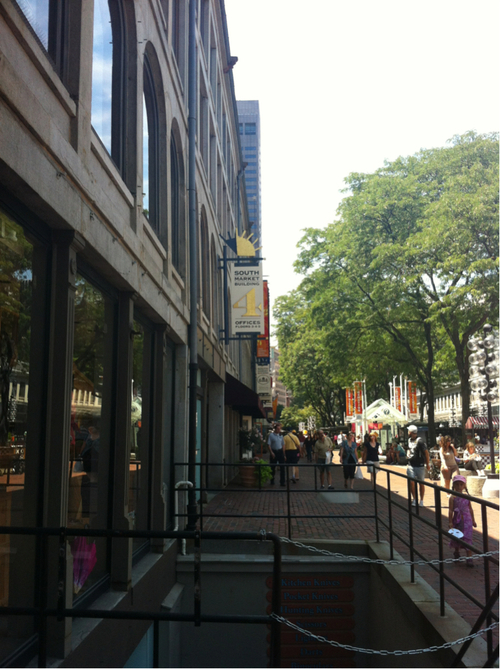 The same goes for the Prudential Building‘s shopping area. I’ve always found Chinatown such an interesting place to go to as well, mainly because it’s another country’s culture within an American city. Any foreign and different culture is automatically interesting to me. But all in all Boston is a cool place, very easily walked, and with so much more to offer than just these many places which are the reasons why I love it.